If you weren’t already on the Geographer hype, there is no doubt that Myth, the latest album from the trio, will help remedy that. Hailing from the Bay Area, Geographer consists of Michael Deni—the band’s guitarist, synth player, and vocalist—cellist, Nathan Blaz, and Brian Ostreicher on drums. 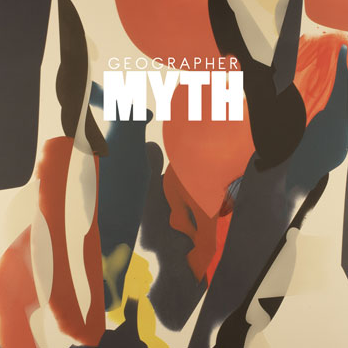 As SPIN Magazine so accurately dubbed them in 2008, Geographer has remained to this day one of the most “Undiscovered Bands You Need to Hear Now”, and Myth proves that they’re more worthy of the title than ever. The way Deni’s deep and soothing vocals compliment the band’s synth-rock sound has always been a Geographer trademark, and is beautiful and strong throughout Myth: even though the latter half of Myth’s ten tracks take a more reflective, pensive turn than Animal Shapes’ overarching upbeat-ness. While some subtle comparisons can be made between Geographer and bands like Passion Pit and M83, the truth is that Geographer’s sound is all its own, and for the most part, unlike most of what’s out there now. Each song on the band’s second full-length release reflects Geographer’s ability to masterfully and beautifully infuse unsuspecting pairings: cello and synth, more upbeat tracks like “Myth of Youth” with slower, more melancholy tracks like “The Boulder” and “Vesijarvi”—with Deni’s trademark vocals interwoven effortlessly throughout it all. Highlights include “Lovers Game,” “The Boulder,” “Myth of Youth” and the re-released “Kites.” Deni started the band after he found a synth on the street—and after Myth, we should feel especially grateful that he did!